by Brad House, Gregg Allison. Zondervan, 2017. Over time there have been strong advocates of the multisite church growth model, and there have been vocal critics. Veterans of the Louisville, Kentucky area Sojourn Community Church (“One church. Four locations”) draw upon their experience and the stories of other multisite congregations to illuminate the model’s value. Practical considerations often drive the decision: Congregations that quickly outgrow their space expand to other sites to accommodate the increase. 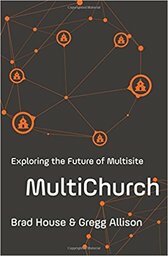 While there is some debate over whether multisite is a biblical model (and examples of that perspective are included), the authors argue convincingly that multi-site is biblically and theologically faithful. They are equally clear about the challenges, primarily related to managing growth that outpaces the organization’s capacity to shepherd it. The appendix offers practical resources including a discussion of micropolity, the way leadership functions in the individual sites in relation to the umbrella organization.